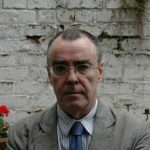 Ciaran Carson has published some two dozen books of poetry, prose and translation, most recently From Elsewhere, translations from the work of the French poet Jean Follain, paired with poems inspired by the translations (Gallery Press 2014). His work has won many prizes including the T. S. Eliot Award and the Forward Prize. He is a member of Aosdána, a Fellow of the Royal Society of Literature, and holds the Seamus Heaney Centre Chair of Poetry at Queen’s University Belfast.